The following step by step tutorial will help you jailbreak iOS 8.4 on Mac OS X using the newly released TaiG jailbreak tool. Supported firmware versions: iOS 8.4, 8.3, 8.2 and 8.1.3. Supported iOS devices: iPhone 6 Plus, iPhone 6, iPhone 5s, iPhone 5, iPhone 5c, iPhone 4s, iPod touch 6, iPod touch 5, iPad mini 1/2/3, iPad 2/3/4 and iPad Air 1/2. Note: Before you begin, you must make a complete backup of your device to either iCloud or locally using iTunes. In case anything goes wrong, you can always get all of your data back using iCloud/iTunes backup. Step 1: Even though this jailbreak tool works on older versions of iOS 8, as mentioned above, we recommend updating your device to iOS 8.4 first if you haven’t already before going ahead with the jailbreak. You can get the iOS 8.4 firmware file from here: Download iOS 8.4 Final IPSW Links For iPhone And iPad. Step 2: Get TaiG jailbreak tool for Mac OS X from here: Download TaiG iOS 8.4 Jailbreak For Mac OS X. 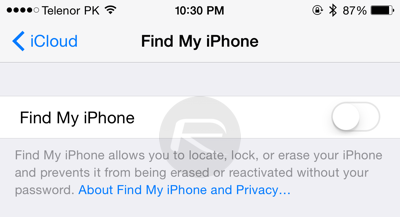 Step 3: Turn Find My iPhone off from Settings > iCloud > Find My iPhone to Off. 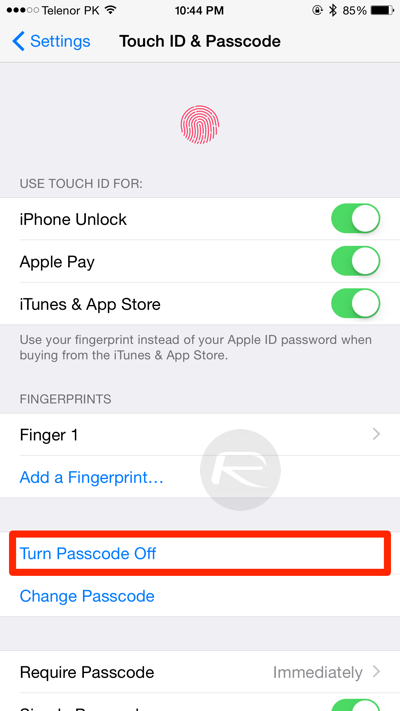 Step 4: Turn off Touch ID/Passcode on your device from Settings > Touch ID & Passcode. Step 5: Now connect your iOS device to Mac. 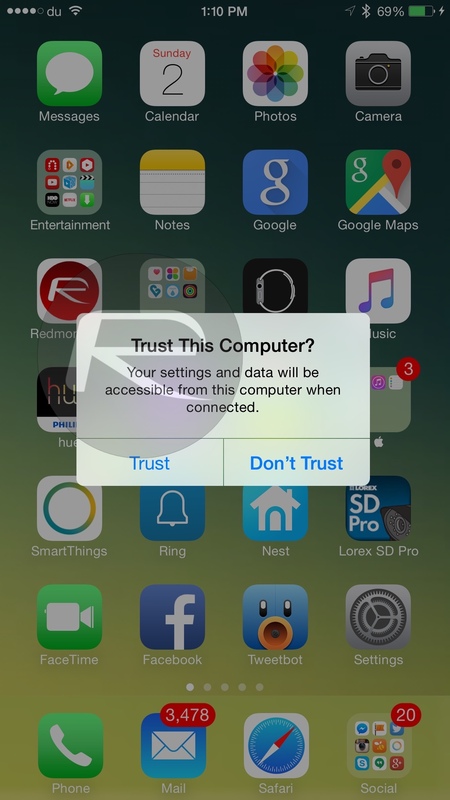 If your iOS device shows a prompt to ‘Trust This Computer?’, tap on Trust. Step 6: Launch TaiG jailbreak tool for Mac OS X that you downloaded in Step 2 above. Step 7: Check Cydia and Uncheck 3K Assistant option. Step 8: Now click on ‘Start’ button to begin the jailbreak process. Step 9: Now just sit patiently for TaiG tool to jailbreak your device. This may take a while. Don’t do anything until you see ‘Jailbreak succeeded!’ message. Step 10: After the jailbreak, your device will reboot automatically and you’ll have Cydia on the home screen. Launch Cydia to start tweaking your device! Don’t forget to enable Touch ID/Passcode and Find My iPhone after the jailbreak. So, how did the TaiG jailbreak tool for Mac OS X go for you? Share your experience with us in the comments section below. Appreciate the information and stoked to get this working at some point in the near future! Tried several times on my mac & iP6 no luck, i then switched to another mac and was a success, not sure what the problem was but it works now. I left my phone in airplane mode with bluetooth off. Everything is in Japanese! Nothing seems to be working! I have downloaded from multiple sources and they all react the same way… I am using a 2010 MacBook Pro running 10.9.3. Please help! I have exactly the same as Justin Kent. iPhone 6 and iPad mini 2, both running iOS 8.4, both previously jailbroken on 8.1.2. First of all, on both devices, I got an message saying “checking Apple driver and network, then “network error”. My guess is that my ISP (in Switzerland) might be blocking a port that TaiG is using, so I unplugged my ethernet cable, disconnected from my own wifi network and connected (via wifi or bluetooth) to the personal hotspot on the device that I was not trying to jailbreak. A couple of times the app also gave me an error message saying that I should have only one iDevice connected, even though the other one was not hard-wired, only providing an internet connection. But whichever way round I tried it, I got exactly the same as Justin Kent describes. The app only gets to 10%, looping reboots on the device maybe 4-6 times, then every time error -1007. After having had no luck whatsoever on the Windows partitions of both my iMac and my Macbook Air, ditto on several friends’ Windows laptops (on investigation it seems to be TaiG struggles with 64-bit Windows), I was really hoping that this would finally allow me to get jailbroken again. but so far it is not to be. 10.9.3 2010 MacBook Pro, it’s all in Chinese(? ), Taig window blank, won’t drag. Will quit. Just heard from Taig. Apparently, this version is for OS 10.10 and up. Said to wait for newer version that would support lower OS versions. No ETA given, but happy to know cause of the error, and that they are working to fix it. I couldn’t Jailbreak with TaiG Mac version so I used the PP version yesterday. But now in Cydia I have an update pending for the TaiG Jailbreak, but it fails if I try to install it. Anyone have the same issue and a solution? When I tried to do this, following the exact steps above, when I launch the Taig jailbreak tool it is only in Japanese and it doesn’t recognize that my phone is plugged in… Any suggestions? Worked great! First it failed at 10% but that was most likely due to not certified cables. Thank you very much! almost always these problems solved when I use DFU restore which I exclusively do just before jailbreaking. I download the taig for ios 8.4 for mac os v.1.0? When i open it nothing happened it’s blank. Appreciate your comment – thanks a lot for taking the time to help. This turned out to be good advice; however, it was not enough to fully resolve the issue. A DFU restore got me 100% of the way there. In the future, I’ll do what you suggested because it clearly does help ease the JB. I think in my case, part of the issue was that I have over 400 apps and it takes a while to reboot. Not sure if that’s related, but I have a hunch it could be one / the other or both. Dude, thanks for your tip! Putting it in airplane mode was the only way I got it to go thru. will taig for ios 8.4 work for macbook pro ios 10.8.5? FOR ALL YOU STUCK AT THE 10% LOOP… I was able to get past it once I disabled photos to automatically open when plugging in my iPhone. (uncheck the little box). worked well for me. Also make sure your iPhone is on airplane mode. Hope it helps some of you out! Did all advised below. Kept getting stuck on 50%. Wanted to avoid doing DFU restore then having to restore all 500+ apps, music, video etc. Decided to do clean reboot (holding power, home screen button until apple logo comes up again). Worked! Hope that helps someone out there.